I so appreciate Eureka in the summer. While the rest of the country is suffering under 99% humidity or 115 degrees in the shade, we are cosily tucked in with a blanket of fog. Yes, the fog can get a little old if we don’t see the sun for several days. However, we are not burning up with heat. And when the sun does come out, nature is singing in its sun shower. This has been a particularly lovely summer. It’s been foggy in the morning, but by late afternoon, we’ve got the sun shower going. Best of both worlds and I have no reason to complain. I’m not even going to make one up. Another part of summer is the beginning of slug season. 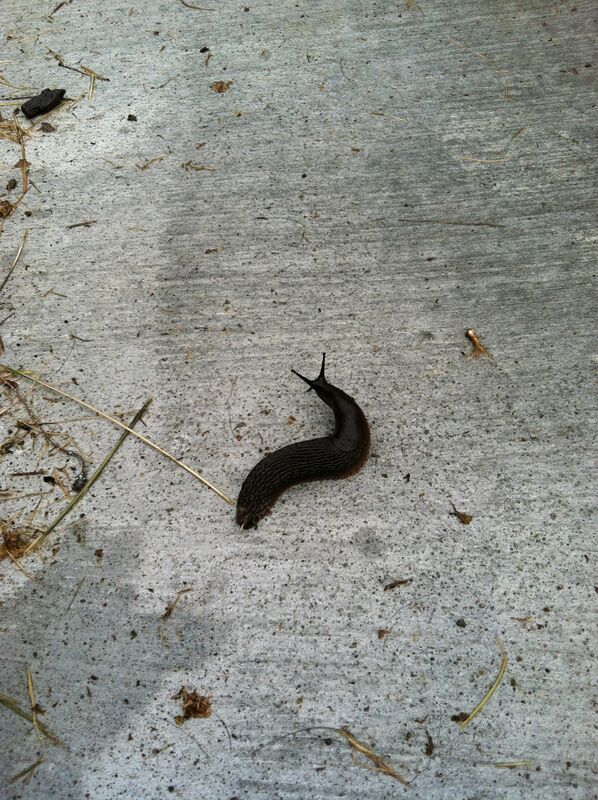 We’ve got slugs all year round, I’m sure, but they seem to parade about more in summer and fall. Our slugs are rather large. Some are brown, some are greenish-yellow and some are greenish-yellow with spots. Most people do not like them, think they’re gross. They leave little slug trails and bits of things they’ve slugged across in their wake. But I’m not most people, am I? 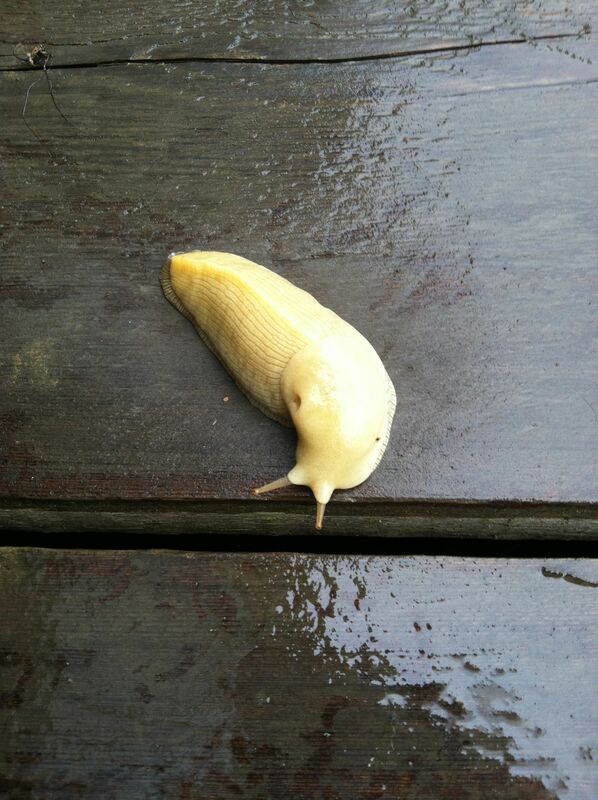 I think slugs are adorable. The brown variety, not as pretty, but nice eye stalks, yes?? 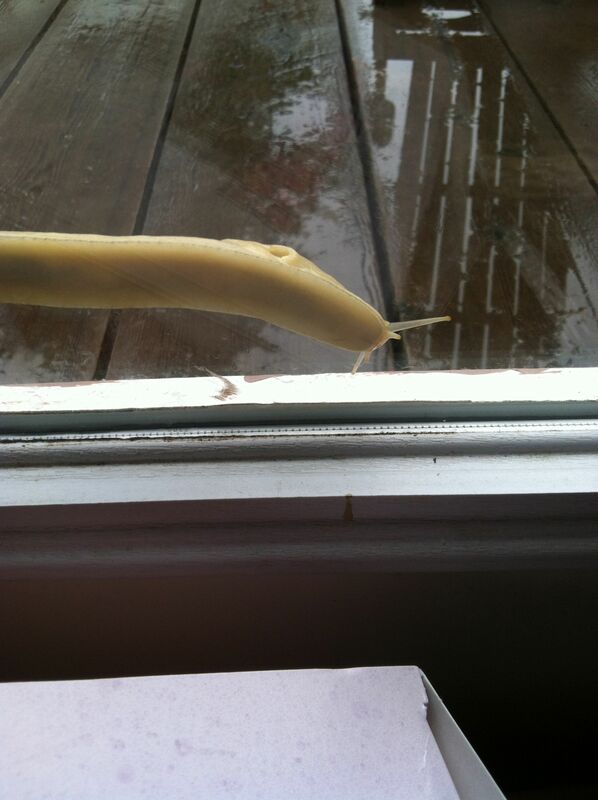 Checking out the French Doors….When they’re in full slug-motion, they can be 7 inches long. I love this! I like slugs, too. And I am ever so envious of your fog and cool temperatures. Must visit the Pacific Northwest someday! Me and the slugs will be here to receive your visit. I’m only a 5 hour drive North of SanFrancisco. Hmmmm…you seem to be obsessed with slugs? It’s their cute little eye stalks, darlin’! !